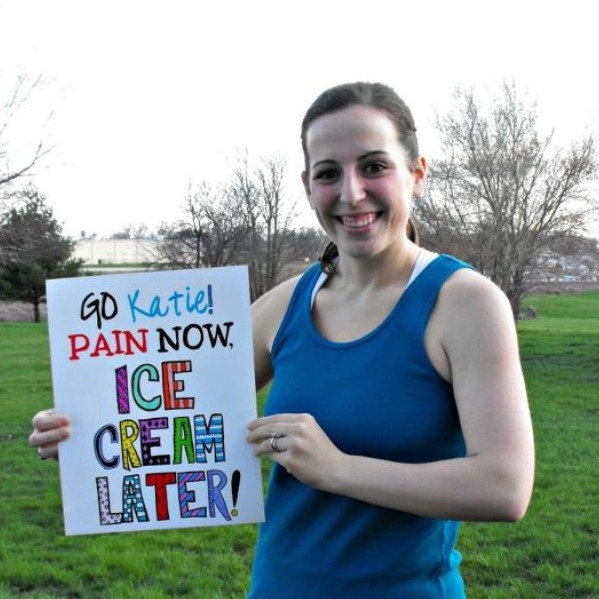 So, here's the nitty gritty deets of my first marathon! Friday night I was SUPER nervous. I just didn't know what to expect. Prior to my marathon, the most I had run was 20 miles. It was a horrible experience. I seriously thought how can I run 26.2, when I could barely run 20? I was terrified. But, my blogging/running friend, Elizabeth, saved the day. She was running her first marathon on Saturday too!! She and I texted all evening, she was a HUGE help in calming my nerves! Thank you, sweet girl! You need to read her recap, she did AWESOME at her first marathon, and I can't wait to run a marathon with her! And then another friend, Carie, made this adorable sign for me! That made me so happy! Thank you so much, Carie! You have no idea how much that meant to me. She said her girls were carrying the sign around the house cheering for me! We have plans to run a marathon together someday too! Friday night, after picking up my packet, we went out to Abuelo's, a Mexican restaurant. I was hoping this wouldn't effect my race, and it probably wasn't the smartest thing I've ever done! But I have never had stomach troubles when I run, so I figured I would be okay, and I was. I've always heard never try anything new before your race...but I broke that rule. Before I left Saturday morning, I ate a peanut butter and jelly sandwich. I usually only have a banana before a race, but I knew a banana alone wouldn't get me through 26 miles! I think that's another reason why my 20 miler went so bad, because I hadn't fueled properly beforehand! I'm very glad I ate that sandwich, and I really believe it helped! 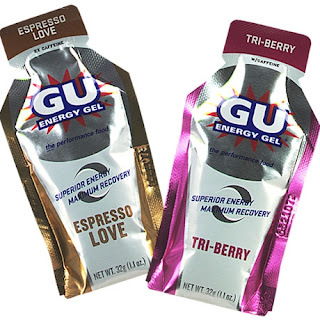 Starting at mile 5, and every 5 miles after that, I would take GU Energy Gels. I carried 4 of these with me in my SpiBelt. Love them! I didn't carry any water with me because I knew there were plenty of water/powerade stops. I drank at most of them. Towards the end I was grabbing both a cup of water and powerade. I was thirsty!! My family was so wonderful and supportive of me. My lovely twinnie would send me texts as I was running, just encouraging and praying for me. Every time I would get a text from her was the EXACT moment I needed to be encouraged. Of course I didn't reply, but I would hear my text alert go off on my phone, look at my arm and read it, and be SO encouraged! Thank you, Annie!! When I had finished, I read a facebook message from my precious Dad. Of course I started crying again. I think I cried pretty much all day long! I love my family!! Saturday evening and Sunday I was VERY sore. I was walking slow and it was very difficult standing and sitting! Jeremy was such a huge help! I don't know what I would've done without him! Of course wearing these shoes for 10 hours on Sunday probably didn't help my soreness! 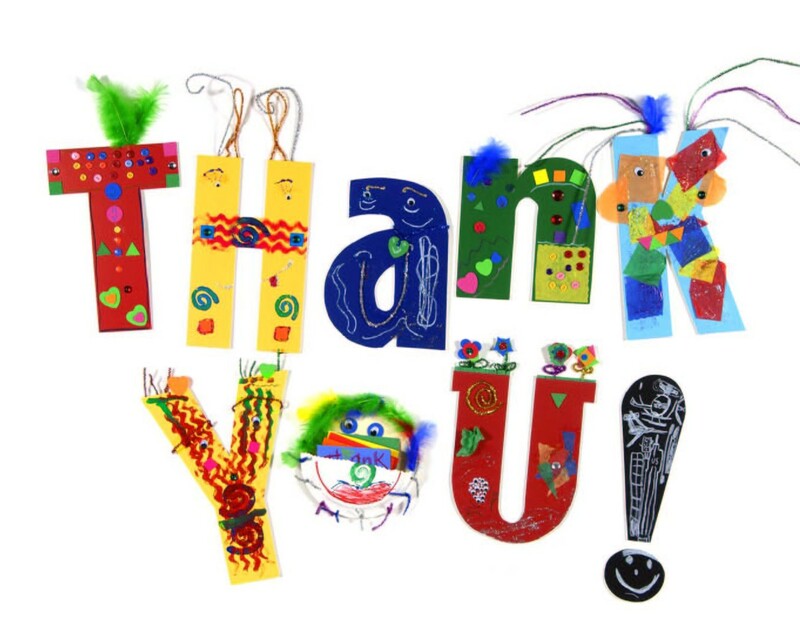 Thank you all, my faithful readers, who I now call friends, for your support, love and encouragement! Thank you to my sweet friends for the little things you did and said that kept me going. Thank you to my wonderful family for your support and for sharing in my excitement. Thank you to the love of my life, Jeremy. This wouldn't have been nearly as fun without you! And thanks to God for running beside me every step of the way. And one last picture... I finally get to put this sticker on my car!! WOOO Hoooo for the sticker!!!!!!! Only a runner can appreciate putting that sticker on! That's right! Seems like I've been waiting forever to do that! You're so creative, I loved it!! My Spibelt is like this, just the original one. I really like it, I put all 4 of my GU's in it, and it didn't bounce or anything while I was wearing it. Definitely get one! Thank you so much, girlie! I'm so excited for your marathon too!! 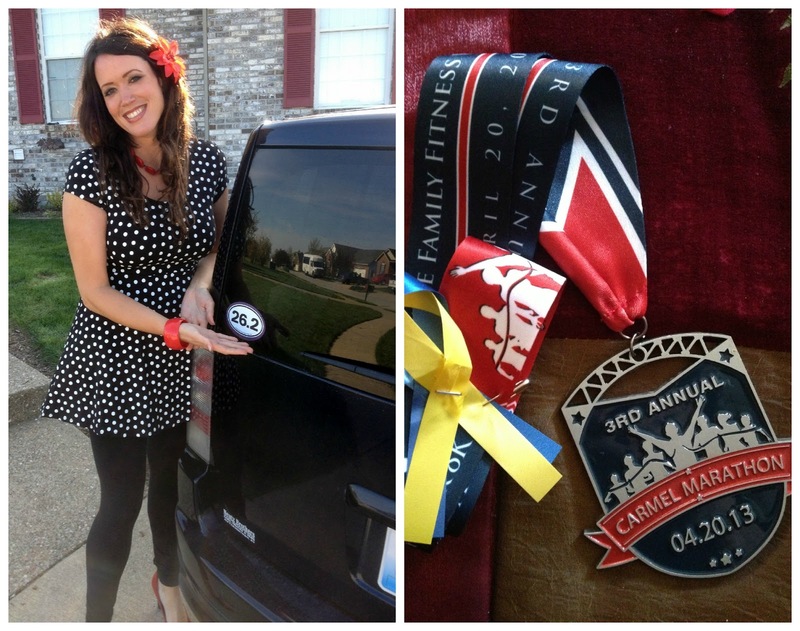 I was most excited about putting my marathon magnet on my jeep too!!!! 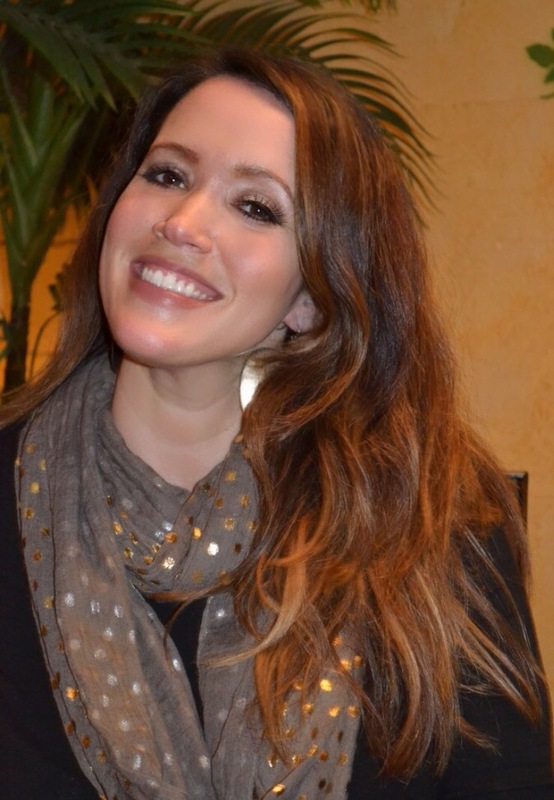 Beautiful picture of you! I was so excited to put it on there! Thank you, Teresa! Thanks, Michelle! Actually the heels kind of stretched my calves, and didn't feel too bad at all! I can't eat after running a marathon either. I have to force myself. The time that I ate half a grilled chicken breast and half a baked potato (both plain, not a thing on them) in the restaurant at my hotel was the time that I recovered the best and the fastest. I think that was my 3rd marathon. You'd think that I'd learn but the last 2 times, I just couldn't do it. I usually have a long drive home and will start to get that light headed feeling and a headache so I know that I HAVE to eat. I have found that fast food fries actually go down pretty easy and taste good. It's the only time I ever eat them but, of course, will never tell any of my friends!!! I knew I had to eat something afterwards, but I sure didn't feel like it either. I don't think I've had fries in YEARS! I'm afraid if I do, I'll get a craving that'll never go away! Lol! Hilarious that you wouldn't ever tell your friends! i love how supportive everyone was-your dad's facebook post was so sweet and texts throughout...wonderful! Thank you, Martha!! I don't think I could've made it without everyone's support, it was awesome! Thanks, Hanna! Lol, why do we do that to ourselves?? Oh i love this post. The sign, your dad's Facebook message (!!! adorable !!! ), and the decal!! You're awesome Katie congrats! I am never hungry when I run either! I ran the Texas Independence Relay in March and I had 3 legs to run. I wasn't hungry all weekend. I knew I had to fuel, but I literally choked food down only because I knew I needed it. Running not only curbs my appetite, but it almost goes in the opposite direction! Haha! I SO know what you mean though, I felt the same way. I was so excited about my 13.1 sticker at first, but then started feeling like I really needed that 26.2! But 13.1 is still a huge accomplishment that most people never reach either! I'm starting to train for my first marathon next month so this was great for me to read! The mileage is daunting but I'm glad you had so much support! Yaaaaaaaaaaaaaaaaaaaaay! I'm so incredibly proud of you, Katie! This recap was perfect and really showed how much amazing support you had. I almost teared up reading your Dad's text. So sweet! Thank you so much, Gina! My support really was amazing! Lol! Thank you! I remember when I used to wonder the same thing! Great job, Katie.....SOOOOOO proud of you! And I remember how great it felt to put that sticker on my car........as the quote says "Always earned, never given". You earned it!!!! Thank you so much, Bill!! Love that quote, it's so true! Congratulations! Love your sticker pic, very cute! I have turned into quite the rule breaker on race eve from eating and wearing outfits I've never worn before. Just call us rebels! Great job! Congrats!! Loved the sweet fb post from your dad! I totally have the marathon 26.2 sticker too. Such a right of passage. You sound like you had an amazing crew behind you. Makes running so much better! Yes, it sure is! My support was so amazing, couldn't have done it without them! That message from your Dad is so, so sweet!!! I couldn't have done this marathon without you girl!! Thanks so much for everything- and I can't wait until we run a marathon together! p.s. always room for ice cream. ALWAYS. Thanks, Anna! I can't wait to hear about your race. You'll do amazing!! Cute picture with the sticker, and you look fabulous in it! You rocked your first marathon! You're such an inspiration, and what a sweet message from your dad! Oh, and I would have some MAJOR problems if I ate that as my pre-race dinner...it wouldn't be pretty! Ha! Thanks, Kristen! I'm really lucky that dinner didn't bother me. I know I took a huge chance with that! Nice sticker :) It's a great one to have finally earned!